By now, you know I'm (hopefully!) enjoying myself in sunny Florida at the MOPS Convention. 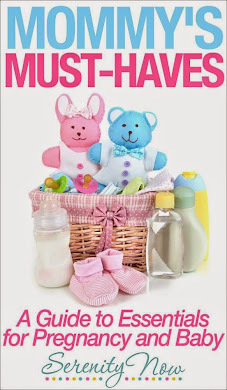 If you're a stay-at-home mom, you should check MOPS (Mothers of Preschoolers) out! Because I am (hopefully!) having such a great time in Florida, I asked Jennifer from Hope Studios to share a fun project with you all today. I enjoy Jennifer's sense of humor, and she has a really neat Tutorial Tuesday party that she hosts each week. Hope you'll leave her some comment love here today and please be sure to check out her blog too! Hi all, it's Jennifer Juniper from Hope Studios guest posting for Amanda this week! Let's make something cute with all those sea shells your kids carried home from the beach! We all do it...come home from the beach with a big bucket of sea shells that smell to high heaven after the long car ride. If you vacation on the East coast, then they are mostly clam shells and oyster shells. They're so ugly, they're pretty. I've always loved the delicate iridescent interior of shells but never found anything to do with them, and after a bit they get tossed into the garbage or out into the sand box. This year I was determined to make something beautiful and useful. I decided to make a dish, inspired by this lovely clam shell bowl by OKA. I chose a large clam shell with a beautiful interior and applied the paste wax, then wiped it off and buffed to bring out the colors and shine of the interior of the shell. Apply just as you would shoe polish or marble polish. See how it brings out the beautiful colors and shine? Hot glue the large shell to a smaller shell turned upside-down as a "base". After it sets, turn the whole thing "pretty side" down to protect the interior and spray paint the entire outside. 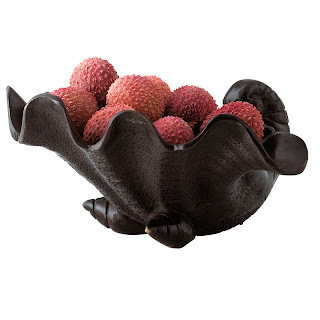 It gives the illusion that it is a metal footed bowl, molded into the shape of a shell. I've decided to create a mini beach in mine and leave it on the windowsill over the sink to remind me of our great trip. And check out the sweet little oyster shell dish next to the sink to hold my rings or earrings. I love the earring holder and the soap dish! So cool. Thanks for sharing, Jennifer! If you haven't already, please be sure to check out yesterday's Giveaway post. The Shabby Chic Cottage is offering a Designer Fabric Pillow Cover to one lucky Serenity Now reader! 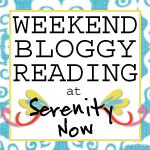 Weekend Bloggy Reading will be back next week with a little twist! I will do my best to return comments when I return from Florida, but please be patient with me. I do read each and every one. I love MOPS and I love Florida, sounds like a great combo to me, enjoy! Okay how cute is that little shell dish??? I love it even better than the inspiration dish! Putting the shell by the sink to hold rings is genius! Totally sophisticated and easy. Now I'm wishing that I'd kept more of the big clam and oyster shells that I found this summer. Using paste wax to bring out the color of the shell is such a smart tip. Wow - those are so fun! I love that dish holder!! Hope you're having fun at the convention. I hope to hit a convention some day! Great shell ideas!! i love it! i just came home from the beach with a massive pile of shells. now i know what to do with the big ones. thanks. I LOVE the seashell dishes!! Also, hope you are having a fabulous time Amanda!